Origin and Habitat: Horticultural origin, selected clone. Fl. Serres Jard. Eur. 10: 101 1855. 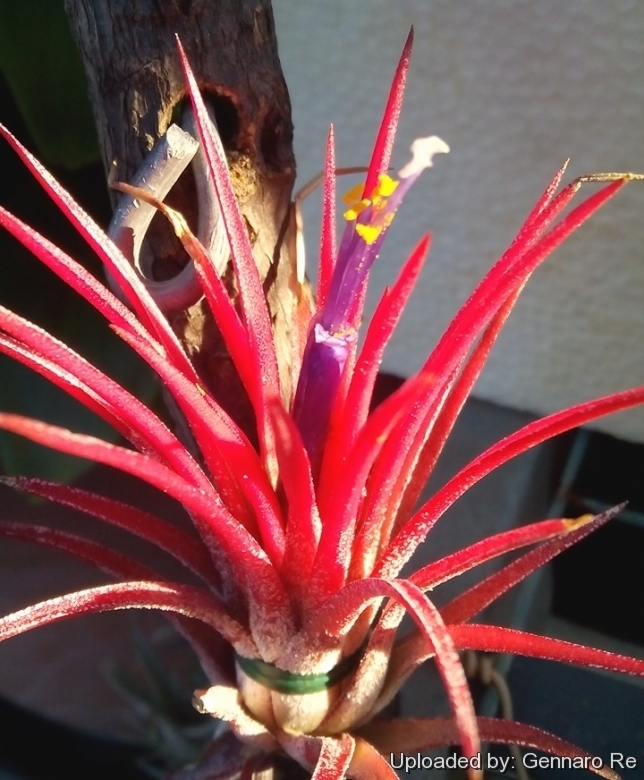 Description: All forms of Tillandsia ionantha are flamboyant red but "Fuego" is especially so. It is one of the most popular air plants in the world with intensely neon red colouration when it blooms and has a tendency to retain a lot of red colouration even after blushing and blooming. Perhaps most spectacular part of this plant's life is days before bloom, when this colour overtakes the whole plant and then shifts to a hot pink, but it will keep this colour year round if left in full sun conditions. It is a cultivar derived from the Mexican form, bred over numerous generations specifically for its colour. This clump forming airplant freely multiplies producing offsets after its display of deep, velvety purple flowers. Rosettes: "Fuego" is one of the smallest species of airplant, with invidual rosettes only reaching 2.5-6(-8) cm height and 4 cm in diameter when mature. Laves: c. 30 forming a tight rosette, simple, linear, narrowly triangular, and sessile, with arching tips, 2.5-8 cm long (rarely over 6 cm long), to 5 mm wide. Covered with coarse, silvery-grey scales that both store water until it can be absorbed and act to reflect intense sunlight from the leaf surface, thereby preventing excessive water loss through transpiration. The outer leaves are green and the inner leaves are deep red at the time of flowering. "Fuego" maintains it’s red leaf colouration for a longer period than most other airplants. If they do not get their optimal light settings they will revert to the typical ionantha grey or grey-green look. Flowers: Long-tubular (candlestick-shaped) purple-violet merging directly from the growth centre. Petals erect, over 4 cm long, viole. The yellow stamens and pistil protrude from the end. Bloming season: These plants will turn bright red in colour and send out their bloom year round if conditions are right and the flowers usually last for a few days. Then send out 2-4 pups which will grow, blush, flower, and send out their own pups. Over and over again. You can separate the new plants, or let them cluster which will then form a ball. Remarks: The leaves of Tillandsia ionantha cv. Fuego are slim and delicate like the Mexican form (Tillandsia ionantha var. stricta), although they have slightly sharper lines, approaching the appearance of the Guatemalan (Tillandsia ionantha var. ionantha) just slightly. It also tends to run smaller than the Guatemalan, similar to the Mexican ionantha. These are just as hardy as any other species of ionantha and is one of the few variants of the species. Tillandsia ionantha cv. Fuego: has smaller intensely neon red coloured rosettes less than 6 cm tall when it blooms and has a tendency to retain a lot of red colouration even after blooming. Cultivation and Propagation: Tillandsia ionantha cv. Fuego is a tiny, slow-growing variety and perhaps one of the mainstays in most everyone's collection, requiring bright light and controlled watering to prevent constant wetness. Starting with a green base, this airplant turns bright red towards the tips of the plant. The visual appearance of the ionantha variety makes it a favorite for use in air plant design. The striking contrast of the deep green/silver leaves with the bright red bloom cycle really enhances any space they inhabit. From single air plant displays to elaborate hanging terrariums, this air plant is a must-have for any tillandsia enthusiasts. It is drought tolerant, and will thrive within a broad latitude of care conditions. Like all Ionanthas, these are excellent for Terrarium and Vivarium use. Outdoors grow the air plant nestled in the highest reaches of a tree where it will receive very bright light and excellent air circulation. Growth rate: It grows slowly, often needing two or three growing seasons to reach maturity. It produces a substantial root system and responds to good cultivation. If one has patience, a large clump can be produced in a few years. Soil: It is is exclusively epiphyte, which means it naturally grows on trees and needs no soil or transplanting. Atmospheric tillandsias cling to just about anything from trees to cacti to telephone poles and can be affixed on a branch or piece of bark, or slabs of tree-fern. Exposition: It grows best in full sun to partial sun. In the hottest climates, it is best given some afternoon shade. In a dark location the plant will gradually weaken and wither. In winter, find a luminous place. Its colour is generally more intense when budding and when getting lots of light. Watering: It takes in all of the water and nutrients it needs from the air so it should not be watered as frequently as other airplants. Just like for carnivorous plants, water them with rainwater or demineralized water. You can mist the leaves once or twice weekly using a water bottle depending on the humidity levels in the greenhouse (or even daily during the hotter part of summer), and make sure the plant gets dry quickly, whilst in winter with low temperatures it is better to leave it quite dry for avoiding possible rottenness. The plants in nature are extremely drought tolerant. The more sun they receive the more water they will need to metabolize all that energy. If left to dry up in summer months you will be left with nothing but little crispy bulbs. Propagation: Extremely easy to grow and propagate as a single plant can grow into a nice multi-plant cluster in just a few seasons. Tillandsia ionantha is easily propagated by removal of offsets at any time of the year. The plantlets must be hung on bark slabs. In the greenhouse you can attach the offsets to slabs of oak wood with small staples holding the roots on the wood until they attach themselves. This can also be done with a small patch of hot glue (just not too hot) to hold the plants in place. Around the base you can use some reindeer moss to cover the roots and to hold moisture.